It has to be said I stumbled across this exhibition. I was visiting Auckland Castle for my day job and was lucky enough to be offered a tour of the 'Pitmen & Prelates' exhibition with the curator. And I'm so glad I was. As a way of celebrating local history, and aiming to build on Auckland Castle's relationships with the local community, this exhibition focuses on how the coalfields of Durham have inspired a wealth of political, social, creative and artistic responses. 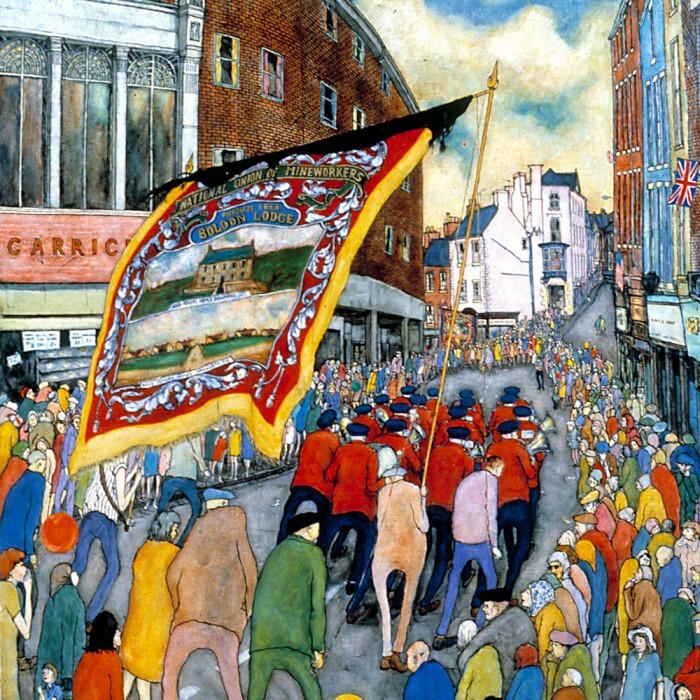 With paintings of the Durham Miners' Gala, at the coalface and scenes from Spennymoor it offers a great insight into the miner's working life and an observation of social activities but so much more as well. The paintings are vibrant, tell a story, are recognisable places and as I discovered, painted by artists who just happened to be miners, rather than Pitmen Painters - that's how they preferred to see it anyway. I've seen and heard much more about the Pitmen Painters from Ashington, and although I've heard of Norman Cornish and Tom McGuiness I've not seen as much of their stuff and didn't know that at one time Cornish and Lowry exhibited together with Cornish's work being the most well-known and popular at the time! The link between coal mining and art is an unexplained phenomenon - other heavy industries such as steel and shipbuilding, both as prevalent in the region as coal mining, don't appear to have inspired creative enterprise like that of artists from the coalfield. Listening to the curator we heard about Bill Farrell, the sketching club at the Spennymoor Settlement, professional artist and former miner of 33 years, Norman Cornish from Spennymoor, about Tom McGuinness from Bishop Auckland, a self-taught artist and miner from the age of 18 until 57, and also about the part women play in the coal mining art history. Including Tisa Hess, the daughter of an aristocratic German general, who married a Jewish businessman and held her own strong anti-Nazi views, who spent much time teaching drawing and woodcarving in Spennymoor. This is a small but fascinating exhibition and well worth the trip to Bishop Auckland. 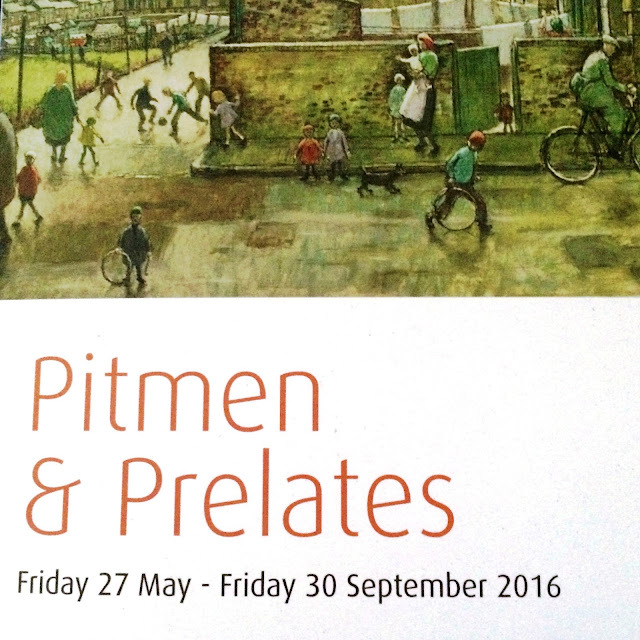 Pitmen and Prelates, until 30 September, Auckland Castle, Bishop Auckland, County Durham. Time: Open every day except Tuesday, 10am-5pm. Where: Pitmen and Prelates, is on until 30 September at Auckland Castle, Bishop Auckland. Boys Club Rating: Not only are the paintings great but a fascinating insight into art and coal mining. Hurry, though. There are just two weeks left to enjoy this engaging exhibition! Love the painting - it's a shame I'm so far North. That is a shame. Glad you liked it though.